Dr. Munson consults with patients with cancer regarding what radiation therapy has to offer, ensures that a treatment plan is designed that would meet the needs unique to each individual, and oversees the care of the patient delivered by the radiation oncology team. He is accomplished in utilizing cancer-fighting, state-of-the-art technologies and strives to provide confidence for patients in the care they receive. Dr. Munson knows there is always greater hope that can be obtained and has made it his career to seek to provide such for patients. Dr. Munson received his medical degree from Mayo Medical School. He completed an internship in preliminary internal medicine at the University of Nevada in Las Vegas at the University Medical Center. He completed residency training in radiation oncology through the University of Texas Medical Branch in Galveston, Texas and the Mayo Clinic in Jacksonville, Florida. 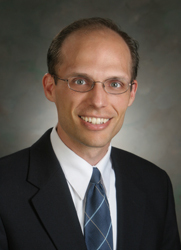 He is board certified in radiation oncology by the American Board of Radiology, and is a member of the American Society of Therapeutic Radiology and Oncology, the American Brachytherapy Society, and the American Medical Association.